It’s always fun to re-consider designs when books move from hardcover to trade paperback. Even just a few years can make you want to update a bit. I started playing around with the color translucent panels and then, as always, meetings took over my days. Once the mechanical was labeled “Late!” I threw it off to designer Jamie Stafford-hill and said, “Kinda like this only, you know, good.” And, as always he delivered. 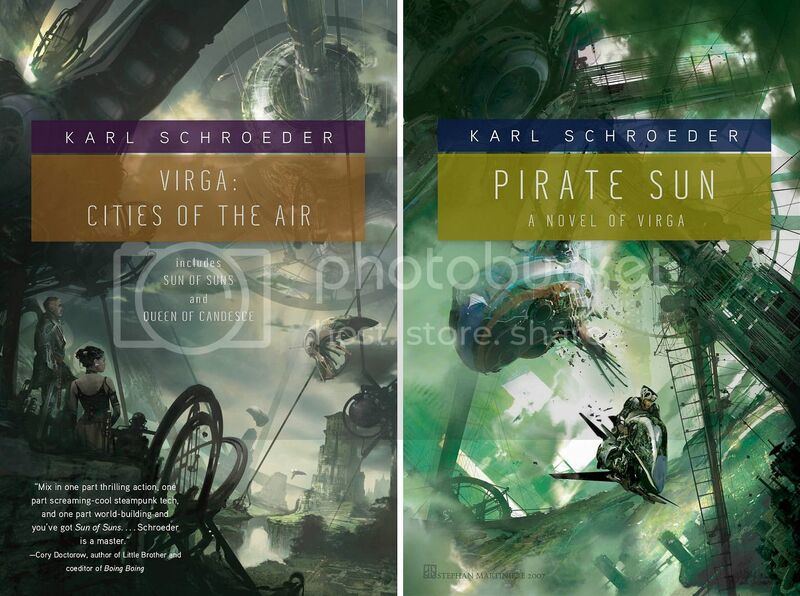 Cities in the Air is an omnibus of the first two novels in Karl Schroeder’s Virga series. Pirate Sun being the third volume. Two more (for now?) to come. I look forward to seeing the whole set in my favorite format. The cover art for the Virga books was what first drew me into the series.